Diving as a Hobby is party art, party style, but mostly just showing up! In addition to being the building required in order to pursue the Diving Hobby, the Community Lot called the Swimming Center is also a place you can have your Sims congregate and cool-off on a hot Sim day, swimming, diving, and splashing around, drinking beverages, and singing songs about the Australian Girl they met at the beach last summer and... Hey! It could happen! Chances are this will be one of the latter buildings you construct in your game - but if the only reason you are building it is to do the Diving Hobby, you may be better off checking on your Neighbor's Towns to see if any of them have built it, since you can use theirs while visiting to level up the hobby. If it is a choice between building the Competition Center and the Swimming Center and one of your mates already has the Swimming Center, I would go with the Competition Center hands down since you can use your mates Swimming Center but you can only use your own Competition Center. Just saying. [color=red][/color] I need a bit of help getting money to buy the swimming pool. Can someone tell me how, and not to get distracted from pooling in all my savings into a new kitchen countertop? 3. Try to plant the simileon sprout (sorry if I spelt that wrong) it's only $250 and you get your money more quickly. I hope you get your swimming pool and if you don't like these ideas these are totally optional and I hope I help. I am on level 23. the swim challenge is up. 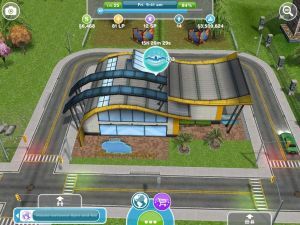 it says to build a swimming center however I have no option to build one. there is simply no swimming center in my game. What do I do now? There is no place that says or looks like the swimming center. How do I park a car at the swimming center????? I have the swimming center built. My question is how do i get more than one sim to swim at the same time. Is the swimming centre a industrial building? How many town points do u get when you build the swim centre I'm 7 this would mean a lot to me as I am level 22 and not got there yet! How much dose a swimming centre cost??! pls answer urgent!!! I just want to have fun at the pool how? Why wont it give me any options to go on the swirly slide,lifeguard chair or the diving board. How do I get a lifeguard chair? I can't use the slide. Why? I can't use my neighbor's slide, diving board, or lifeguard chair. How much is the swim center? ? When I try using the lifeguard chair, the slide, or the diving board, no options show up. How can I make the sim supervise in lifeguard chair??? Hey! How to build the Lifeguard Chair, I'm stuck in this mission..
How do I get a life guard chair? I thought this was about CHEATS to get the SWIMMING CENTER?